Right, here we are. Indoor season (in the north hemisphere at least!) and I've come through the winter uninjured, and with reasonable mileage under my belt. I'm really enjoying my training with my coach Jon Tilt (World Masters M55 400m Champion, World Masters M55 400mH Champion, and World Masters M55 4x400m Champion), and I've allowed myself to start layering on a bit of speed to take me into the indoor races. And (without film evidence to back it up) I do believe that the new gait is better embedded and well on the way to being subconscious. So, three and a half years after starting the gait change journey (has it REALLY been that long?!) I now find it completely natural to land under the hips. I do constantly do a round-check of my proprioceptive cues, and usually everything below the waist is in order!! However, I know that I still need to work on my core, as I often catch my back bent, and my arms pulled up and crossing my chest. A quick "Keith's Game Changer" drill (well, the second part of it - whilst on the move) sorts it out, but it's annoying that it keeps happening. I did hear the great coach Rod Lock shout, exasperatingly, at one of his athletes (it wasn't the Great British international Alex Teuten by the way) "how hard is it to keep your arms at 90 degrees!!! ", and I replay that sound bite to myself when I catch my arms up at my chest. Unfortunately, I catch them up there all to often. Anyway, back to the track races. I don't quite remember the point at which, in January, the motivation to enter a few indoor races kicked in. I'm not a great fan of indoor tracks - only 200m and banked. The 800m is 4 laps, and without any sense of sarcasm in my words, on the 2nd and 3rd lap I sort of lose track of where I am. Outdoors is easy. If you haven't heard the bell yet: you're on the first lap! Indoors, that second and third lap blend into one, and it takes conscious thought to gauge how much energy there is left for the remainder of the race. I know that practice would help, but when the closest indoor track is 101 miles away in north London (including a semi circumnavigation of the dreaded M25), it's not going to happen often. I actually think that the motivation to do some indoor races came from missing most of the t&f season last summer, as well as the desire to see the inside of more indoor arenas than just that Lee Valley centre in North London. Also, the prospect of a couple of days out with mates is also appealing. The result? Well, Cardiff threw up a bit of a shock! I guess it was my first properly competitive, properly prepared 800m race since March 2018, and it was a slightly tactical heat with a few elbows (the most enjoyable form of 800m racing! ), but a 2:12.10 was alarmingly slow. The only saving grace was that I finished with absolutely no lactic, so I knew there would be better to come. That's all for now. Thanks to the OYF Running Group on facebook for the inspiration to get back to this blog. ...well, officially it's the second edition of the brilliant Older Yet Faster. And although the foundation on technique and the potential outcomes are the same, the book is so new, and so significantly updated, that in my humble opinion, it's basically new!! Congratulations to Keith and Heidi, I hope this is as successful as it deserves to be. I see it's out in print and on Kindle from Amazon in the UK. On the running front, I made a bit of a mistake way back in April. Elated at my 800m indoor personal best, and feeling invincible, I went straight into summer speed training with my training family (the Jon Tilt 400m group here at Southampton AC). This led to a 4:49 mile at the British Master's Championship at the end of May: a silver medal to another Adrian Haines victory. However, it turns out I was not invincible. Who knew? The lack of a spring season tempo run build up, progressing straight from slow winter base miles into summer speed, put incredible pressure on my ageing ligaments, and I hobbled away from that mile race. I stuck on a vest and shorts, and enjoyed the long, hot summer we had in the UK this year. Ugh, work just gets in the way of running! Well, to be more accurate, gets in the way of writing about running... sorry about that. I was always skeptical that I could break any personal bests at 51 years old, and 10 years after getting into middle distance running in a serious way. But Keith insisted that it would happen, and was confident enough to assert that "if you don't, you'll be the first"! So 8 weeks ago, at the British Master's Athletic Federation indoor t&f championship, I broke my all time indoor 800m time, with a 2:07.64. I've had a number of 2:08's before, but this is the first time I've gone under that mark. And I don't even like the indoors! That time was not good enough to take the MV50 title like I had done last year. But it was a much more rewarding race in that I had friends Adrian Haines and Gary Burnett, and the brilliant newcomer Dominic Bokor-Ingram to race with this year. We all finished within 2.5s of Adrian's 2:05.08, and I just managed to hold off Gary for the bronze. As a bit of winter base training, and just for fun, I ran the Bournemouth marathon last weekend. I wasn't aiming at a time, just to enjoy the run, take advantage of the water stops, and to be part of a big event. A quick word on gait - now that I'm not ramming my heels into the tarmac 40,000 times in 3.5 hours, I found that I recovered incredibly quickly. I can't believe how little damage I did to my legs. I was waiting for DOMS for the next 48 hours, but it never came. So 54 hours after hitting the finish line in Bournemouth, I was running in the club's Tuesday evening 6x800m off 60s session. Sure, I ran the first efforts easy in case something broke, but the last two efforts I was hitting sub 2:50 which is up with my best for this session! Anyway, this post is more about the nutrition learnings. The following graph shows heart rate, but I also selected elevation (the thin green line) as it explains some of the heart rate variations. The very flat sea-level sections represent the flat seaside promenade on Boscombe, Bournemouth and Poole seafronts. The black line is heart rate. Click on the graph for a full size version! In terms of effort, that first 4k felt very easy. I was letting people pass me (and I had started in the third pen back), I was chatting, and I hit 4:50/km on average. Then as you can see, there was a downhill section at 4km, that flattened out. I suspect that the pace and cadence increased, because as the downhill flattens out, you can see that the heart rate raises as I must have tried to maintain the faster pace (the red box). Certainly I was now overtaking people. I remember looking at my watch at about 10k and seeing that the average pace had come down to 4:41/km. From 5km to 21km the heart rate is higher, and as I would soon find out, above the fat burning zone!! From half way, I was in trouble! 10 miles of burning glycogen had left me depleted. I took a couple of gels from the feed stations (I think about half way and again at about 30 km). At 30km I thought I was going to have real trouble finishing. Walking the two hills had taken their hit on the average pace, and I was down at 4:57/km. 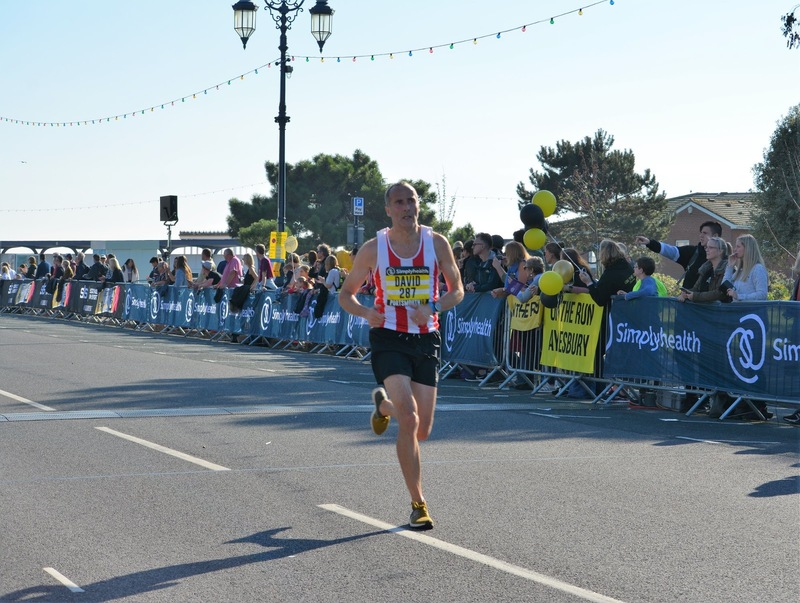 Back to the Bournemouth Marathon. 30km. You can see that the heart rate comes back down (the green box). And this is where I start to recover. I remember, from the 6 marathons I did between 2001 and 2006, when I hit the wall, I REALLY hit the wall. Half Foster territory. Once in London, I had to walk from Tower Bridge to Canary Wharf. But not at Bournemouth last weekend. The wall never came, I think it was about half a mile down the road the whole last half. This time, I believe I had enough retained ability to metabolise fat that I experienced a bit of a recovery, and the pace never dipped slower than 4:57/km. Going through the 24mile marker, I realised I had 19 mins left to get under 3:30, and I thought "what the hell". So for the last 2.2 miles I really picked up the pace, bringing the agerage back down to 4:56/km. I hit the finish in 2:29:50!! Boston Qualifier by 10 seconds! So, although the highest heart rate at which I can run on fat alone has probably come down a bit, the ability is still there. Keith and Heidi come to town! Two months on, and I still cannot believe how lucky we were to have Heidi Jones and Keith Bateman visit us at the Southampton Sports Centre in July 2017! Heidi and Keith were over in the UK visiting family, and enjoying the New Forest, and for us it was an opportunity too good to miss. 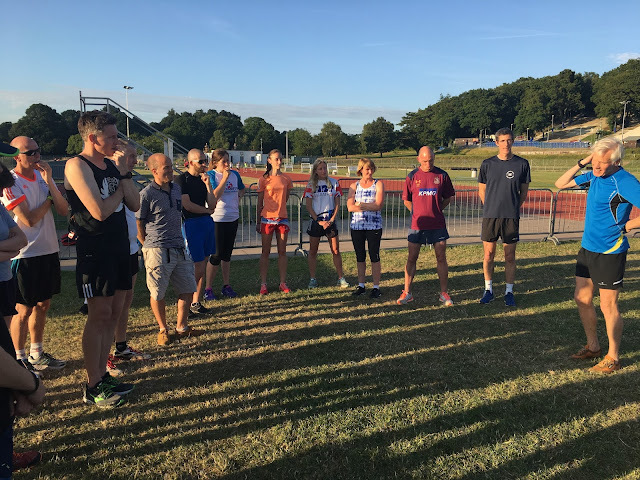 A group of 20 of us, from as far afield as Watford (Adrian Harwood), Bristol (Susie Baker) and Crawley (Adrian Haines), were split into two, taking it in turns to do a gait session with Keith, and a foot strength session with Heidi. The sessions gave us all something personal to take away. Some of us are new to the techniques, to the drills, and to the joys of the spiky massage ball! Others have read the book (in some cases multiple times) and are practiced, filmed, and well on the way on our journeys. During Keith's session, as we were practicing technique on the track, Keith noticed that I was lifting my knees too much (for the pace involved), and I have managed to correct that since on my slower/recovery runs. When Heidi asked if there were any particular points anyone would like to raise, I complained of ongoing dull ache in the Achilles. Heidi demonstrated an exercise that, with very few exceptions, I've employed to excellent effect every evening since. Heidi claimed the effects would be felt immediately, and she was right. I've tried to describe the exercise at the bottom of this post. Anyway, we all had a fantastic evening, made some new friends, and left with much to think about. And we sent Heidi and Keith away with a couple of decent bottles of English (Kent) wines as a small redress of the balance of Australian wine that reaches our shores! And again, a HUGE thanks to Heidi and Keith. This exercise will not only strengthen Achilles, but provide almost immediate relief from Achilles ache, which feels strange at first as most of us resort to actually stretching them to get relief, not shortening them! But it worked for me and continues to do so. with straight legs, raise up on to your toes. Don't strain, but raise as high as you can hold for 45 seconds. after 45 seconds, keep the feet as they are, but bend your knees. Again, not so far that you're having to work hard to hold the position, but so far that you are still comfortable. That's probably kneecaps about 25cm forward from the straight leg hold. Again, hold for 45 seconds. repeat these two holds another two times each. That's 6 lots of 45 seconds in total. Thee whole exercise lasts 4mins 30 seconds. So still a 4.5 minute session, but just gives you a little extra, and I find that it helps to make sure that neither leg is "cheating"!!! I still do the first 90 seconds on both legs as a sort of a warm up. 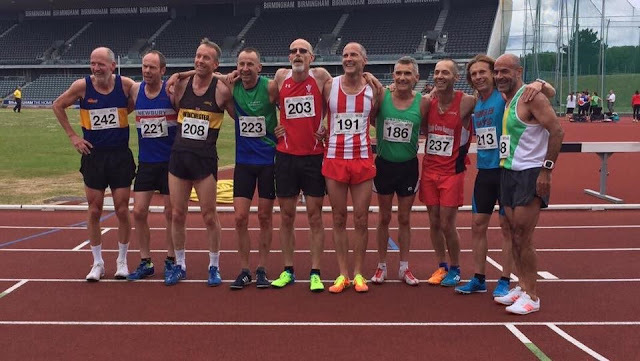 The track and field season is over, and with a final 800m race, as part of the South of England Club Championships, on Sunday 3rd September (and yet another 2:06 over the distance! ), it's time to reflect on what's happened this summer. Armed with my new gait, I aimed to better my 800m time (from 2014) of 2:03.75, with [what I hoped] would be a 2:02 or even 2:01. This has not happened, and the best I could manage was a 2:06.2, quite early in the season. ONE: 2017 was the summer when I learned how to run properly at speed. It was a time for perfecting. The opportunities for changing gait at speeds of 2:40/km, and under race conditions, are thin on the ground. I've learned a lot this summer, and I will go quicker next year! TWO: on three out of the four 2:06 performances, I did not hit the lactic wall before the finish, meaning I could have gone quicker. I forgot how to hurt myself. Although I managed eight 800m races this summer, they were over a 4 month period, and that's not compact enough. 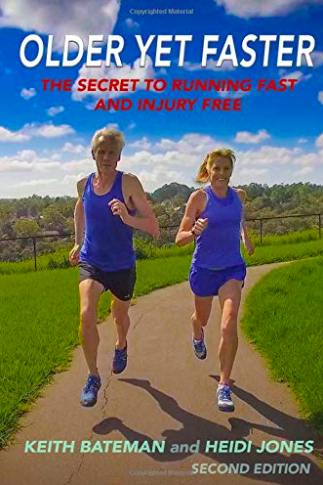 Getting into 800m racing at the start of each season is about reminding your body that, despite exerting yourself at your limit, you're not actually going to die (literally - read Dr. Tim Noak's central governor theory). This is why athletes will almost never achieve their best 800m performance within the first 3 races of the year. My performances were too spread out, and next year I will plan better and compress them into a shorter time frame. 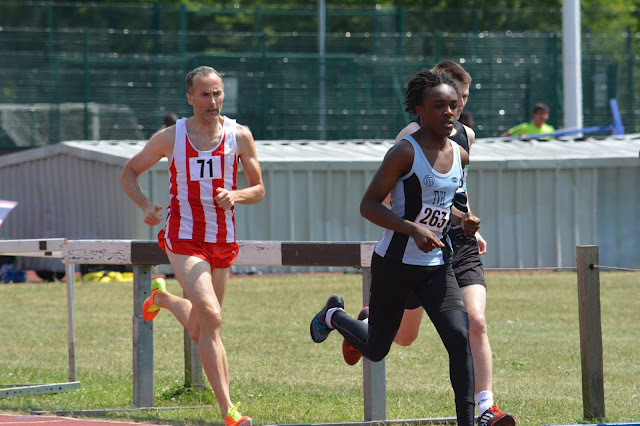 THREE: in my one and only 400m race this year, when I had to open all the stops, and just one week after a good 800m performance, I came within 0.2s of my 400m personal best, with a 55.9s. I had to push myself on that one, I did hit lactic, and it proves I have the speed for a 2:03 800m. FOUR: I won the British National Championships at the V50 age group. Here I am with some very good friends, old and new. Four of us doubled up in lanes, meaning we could all enjoy one race. So now it is in to Road Relay season, with the county, southern, and national relays on the calendar. And the cross country, which I very much enjoy, but am not much good at! I also got a number swap for the Bournemouth marathon from a friend who is not ready to run (not that I would call myself over-prepared!). The race is 5 weeks to the day after that last 800m, and with a week off from the season to recover, that leaves me with 4 weeks to train. What could possibly go wrong? Needless to say, I'm treating it as an excellent winter base training opportunity on a get-round strategy! I'm now well into my first summer of speed since starting the gait change journey, with some interesting observations. I've run a couple more 800m, the best of which was a 2:06.2 as a guest at a Southern Athletics League (SAL) match. Whilst it's a seasons best, I was hoping to be at the low 2:05 by now. 2:06.2 is only 0.3s faster than 5 weeks ago (2:06.54 at the Hampshire County Champs). However....! .... and here's the point of this post. This summer I feel like an old canvas tool bag - all the bits rattling around inside! I've got niggling aches and pains everywhere, and I even had to take 9 days complete rest 3 weeks ago with a groin strain. 2017 is like I'm a beginner again, and I'm expecting this beginner to run very fast indeed! In other news, it's the British Masters' T&F Championships (outdoor) this weekend, and I'm just running in the 800m on Sunday. Wish me luck!